Never heard of al fresco dining? Translating to “in the open air,” an al fresco meal is like an upscale picnic outdoors with an array of delicious Italian snacks for sharing—and who doesn’t love an Italian picnic? Our Specialty Merchant Ken put together his favorite picks for eating al fresco. Read on for tips on hosting your own this summer! Thanksgiving is just a few days away, so there’s no better time to pick up a few last-minute ideas to make the preparation easy for the feast of Thanksgiving sides, desserts and drinks. More great Thanksgiving tips from Everyday Food Magazine. Still need a little help to prepare the main course? See their list of foolproof Thanksgiving Turkey Tips, featured last week. And don’t miss the holiday-ready Everyday Food recipes in our One-Click Recipe Thanksgiving section…. Beware! The witching hour approaches. Ghouls and goblins are gathering. Black cats and black bats stalk the dark corners. But there’s no need to fear… you’ll be prepared for fiendish festivities and hungry hordes with a few great tricks (and treats!) from the team at Everyday Food magazine…. What’s the Best Apple to Make Apple Pie? Empire, Honeycrisp and Golden Delicious apples are some of the best apple types to use in Apple Pie. It seems like a riddle, doesn’t it? After all, all apples look the same. So, does it really matter which apple you use to make a pie? Um, yes. If you want your apple pie to be super tasty, you need to choose an apple with great texture that’s also tart and sweet. The apple you choose needs to hold its shape after baking, which means it needs to be just mushy enough but still melt in the mouth…. The school year is still fresh, but if you’ve already run out of creative ways to make lunch, the prospect of brown bagging can begin to feel like a drag. Improve your lunchbox IQ with a few smart lunch ideas for the kids (or yourself!). These tips from Martha Stewart’s Everyday Food Magazine will get you started on the right foot. 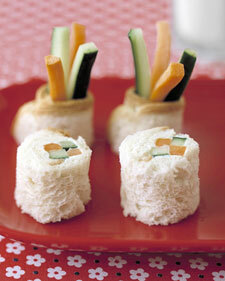 Wrap vegetables in bread to look like sushi. Craving burgers or kebabs? Hosting a summer patio party? Planning a big cookout for Labor Day? If you’ve ever accidentally incinerated your supper over the flames of the grill, never fear! Last week, a mighty pyramid was toppled by the humble dinner plate. For nearly a century (since 1916), the USDA has provided nutrition and food guidance to Americans, and the food guide pyramid has been a big part of that for the better part of the last 20 years. After fiddling around with flow-charts, food wheels, brochures, and pyramids, USDA nutrition guidance looks to be coming back to the dinner table….